De Oude Werf Guest House, in the heart of Wilderness, with its sweeping views of the Outeniqua Mountains, offers warm South African hospitality in a setting decorated with some of the finest antiques that one can find. The en-suite rooms are individually styled and have all the necessary facilities for those who prefer a self-catering arrangement, including DSTV, bar fridge, coffee/tea, hairdryer, ceiling fans, braai facilities etc. De Oude Werf is 18km away from the George Airport and ideally suited for business people and golfers with easy access to the main business centres and championship golf courses in the Garden Route. Walking distance from the beach, restaurants and pubs. 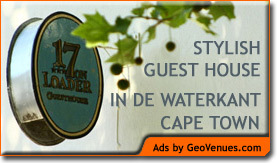 We are looking forward to welcoming you to the Garden Route!